The medical director at the Iowa Department of Public Health (IDPH) says flu activity appears to be heating up as the temperatures dropped in the state. 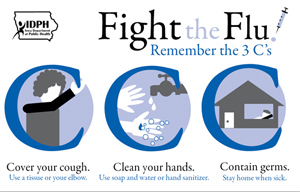 Quinlisk says the flu can be fatal, especially to groups like the very young and the elderly, who are more susceptible. “We’ve had four people die directly of. The number of people who got the flu — and then got pneumonia and then died — those we haven’t calculated yet,” Quinlisk says. The known flu deaths involved two middle-aged adults in central Iowa, one middle-aged adult in eastern Iowa, and an elderly adult in central Iowa. Quinlisk says the flu vaccine is the best prevention. If you haven’t gotten the flu vaccine, and think you may be coming down with the flu, Quinlisk says you should check with your doctor as soon as possible. Quinlisk says you can still get a flu shot now and be protected. And she stresses again some simple things to prevent the spread of the flu. “Contain your cough, keep yourself at home if you are ill, and clean your hands. That will go a long way toward not only preventing the flu, but a lot of other viruses that go around this time of year,” Quinlisk says. Contact your health care provider or local health department to find out where you can get the flu vaccine in your community or use the Flu Vaccine Finder at www.flu.gov.